Description: It is a large, week-stemmed climber and needs support to grow. Stems have numerous small eruptions. The bark is papery and peels off in thin flakes. 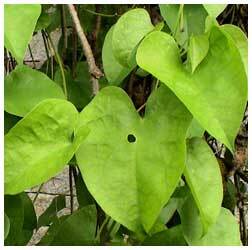 Leaves are heart shaped. Wiry aerial roots are often seen dangling from the shoots. The plant comes to bloom during summer. Flowers are small and male and female flowers appear separately. Fruits are round, pea sized and on maturity turn attractive red. How to Grow: In the wild this plant is often encountered growing on trees and hedges. For home herbal garden, one plant in the ground or in a pot of 25-30 cm size is adequate. This plant can be trained around pillars or along fences. Collection: Mature stems of pencil thickness can be cut with the help of sharp knife as and when required. Periodic harvesting can, thereafter, be obtained for many years from the same plant.